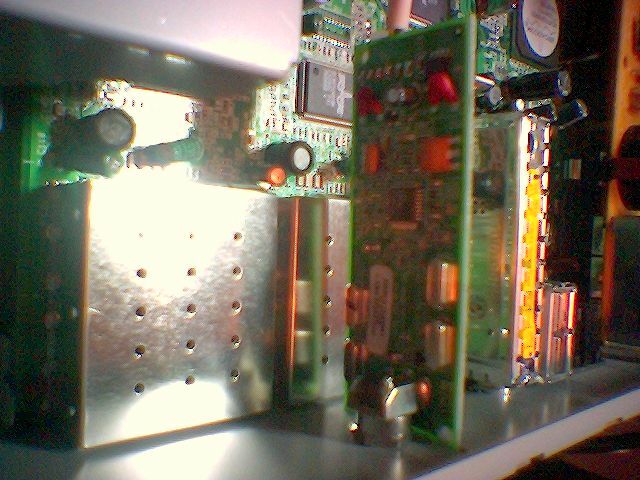 Never one to shy away from voiding a warranty, I decided to take the plunge and pull apart my malfunctioning 9200 PVR to see if I could figure out if the hard drive had any sort of AAM (Advanced Acoustic Management) enabled. Opening the case was easy enough. It consists of removing four screws holding the top cover on. The cover on my unit was a little tight, and needed some gentle persuasion. 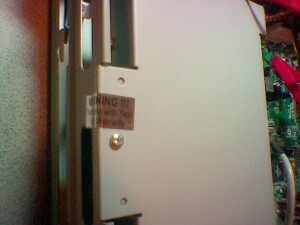 Once the cover is off, you’ll notice a small silver sticker on the hard drive bracket. 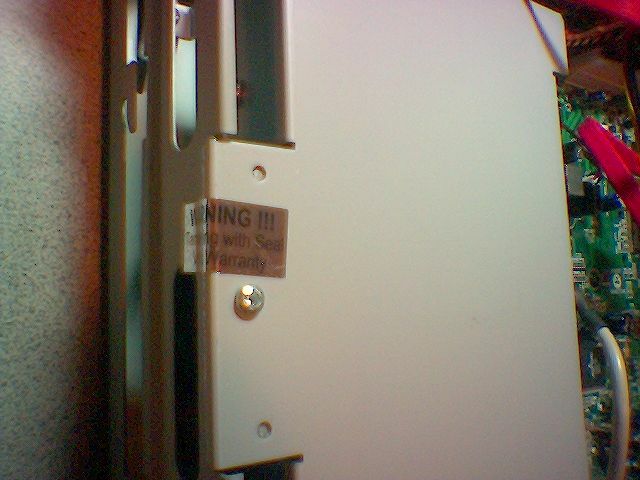 This makes it impossible to remove the hard drive without breaking the sticker and voiding the warranty. Luckily, drive removal was unnecessary because I was able to remove the SATA cable and power cable from the drive, and plug in cables leading to my desktop PC. Once hooked up to the PC, I was able to recognize the drive in the BIOS. 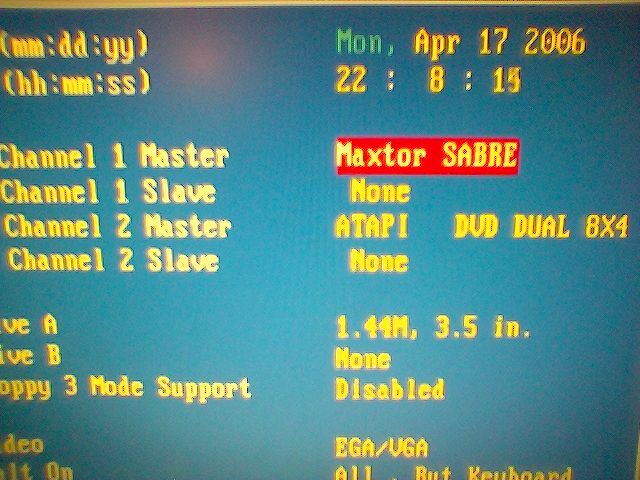 It comes up as a ‘MAXTOR SABRE’ drive. 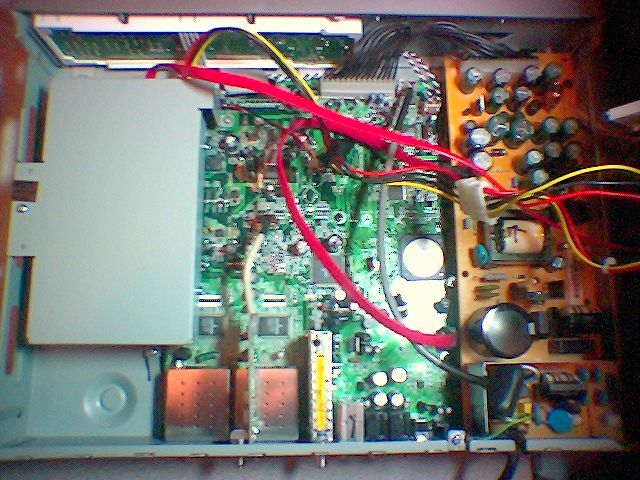 At this point, I tried several utilities to see if I could detect and adjust any AAM setting on the drive. I tried several DOS-based utilities (the Hitachi utility is supposed to work with many manufacturers’ drives, but didn’t work in my case). The only utility I was able to make work was a utility called Doc’s AAM Utility. Unfortunately, this utility is in German, and my German is non-existent. 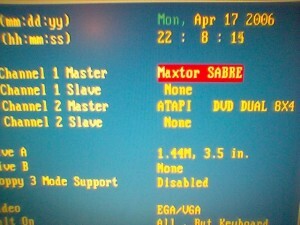 It appears that the drive was recognized, but that AAM was not supported on the drive. As of yet, I’ve been unable to confirm or deny whether AAM is a feature of this drive. 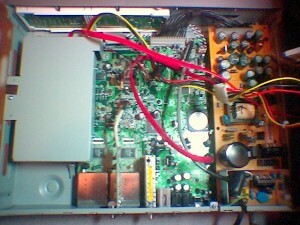 It’s late, so I decided to put the PVR back together and call it a day. 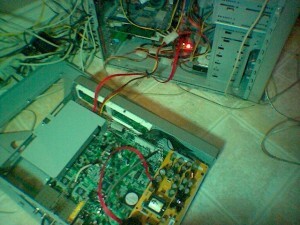 This entry was posted in archive and tagged 9200, bell, pvr by ian. Bookmark the permalink.